Red oceans are all the industries in existence today – the known market space. Blue oceans are all the industries not in existence today – the unknown market space. Why do we call them red oceans? Why do we call them blue oceans? Unexplored and untainted by competition, ‘blue oceans’ are vast, deep and powerful in terms of opportunity and growth. What is red ocean strategy? Red ocean strategy is all about competition. As the market space gets more crowded, companies compete fiercely for a greater share of limited demand. 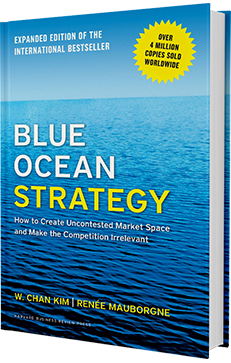 Blue ocean strategy creates new demand. Companies develop uncontested market space rather than fight over a shrinking profit pool. What outcomes does red ocean strategy produce? Competing in red oceans is a zero-sum game. A market-competing strategy divides existing wealth between rival companies. As competition increases, prospects for profit and growth decline. What outcomes does blue ocean strategy produce? Creating blue oceans is non-zero-sum. There is ample opportunity for growth that is both profitable and rapid. Professors Chan Kim and Renée Mauborgne introduced the concepts of red and blue oceans in their international best-seller Blue Ocean Strategy. First published in 2005, it was updated and expanded with fresh content in 2015. It has sold over 3.6 MILLION copies and is being translated in a record-breaking 46 LANGUAGES.